Hope you are all well and enjoying summer holidays. Again, I have some rather exciting news to share. I have decided to do a weekly radio show focused on soulful, deep & jazzy grooves - Urban Haven. First session to be broadcast on Fullhouse Radio on Monday 13th August 2007 at 1.30pm GMT. All sessions will be available for download afterwards. Hope you will tune in and enjoy it. A lot of great things happened to me in past few months. I was enjoying Netherlands in January and during Easter Holiday. Two unforgettable parties with best house music plus few days off in Amsterdam. I have managed to record two new mixes - Sensual Sushi Sampler "Sunset" and "Sunrise". They are dedicated to the forthcoming summer Sensual Sushi party. Sunset mix has already been broadcasted by Motion FM and they both have had very positive feedback. CD covers are included as usually and tracklists are at the back of each CD cover. Many thanks to Tom Cowe and PhysicalMagic for their vector artwork! 2nd PRIK's anniversary - truly unbelievable party with only the best house music, gorgeous people, mouth-watering dinner and plenty of delicious champagne. This is a unique event set in a beautiful surroundings of Amersfoort, just few kilometres from Amsterdam. Finally. New website design - links section, guestbook works again, you just need to type vertification number from the picture to post a message. Couple of new mixes (Special Mix for Afrodisiac Show & For Lonely Souls) and few old pieces from my archive. Few of them have CD cover. Check them out in mixes section. Good news. I made another mix - Juicy Bits. This time it will take you more into latin grooves (I suppose because of the summer :) and finishes with sweet deeper tunes. It features amazing tracks such as "Gotta Be Love" by Soulplanet Jazz Ensemble, "Baila" by Chus & Penn, stunning "Beautiful Boy in Brazil" by Physics, long overdue Solymos by 4 Siders or BRS' Too Late. And to finish it out you will get deeper with Steve Stone's remix of Beautiful and Roland Clark's famous acapella. If you read my biog you should know what the first thing was that got me into house. 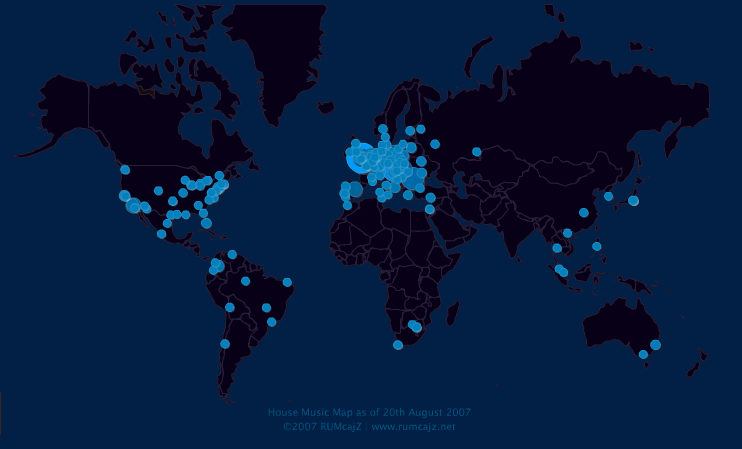 I thought it might be interesting for you to listen how house music was 5 years ago (it hasn't change so much, has it? :). So here you go - Dance Hits 2001 part ONE and Dance Hits 2001 part TWO. Enjooooy!